Instead of Server Operating System, You Can Use Your Mac OS X or Linux to Generate CSR File for SSL Certificate Request. Most probably fails to understand the fact : the guides on SSL Certificate authorities are written for Microsoft Windows users not for us. They probably can not generate readable / secure key / csr. If we generate on our own Mac or Linux PC, we can actually manage them and keep them in proper place – loss of key or csr will not happen! You will see your existing files. You can open that file thecustomizewindows.com.csr ; simply supply that file. Tested with GeoTrust with my MBP. GeoTrust’s automated system actually can read it nicely! 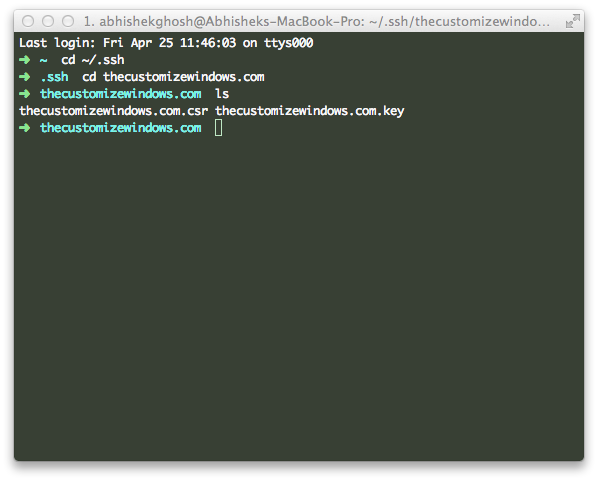 Cite this article as: Abhishek Ghosh, "Generate CSR File for SSL Certificate Request on Mac OS X," in The Customize Windows, April 25, 2014, April 18, 2019, https://thecustomizewindows.com/2014/04/generate-csr-file-ssl-certificate-request-mac-os-x/.